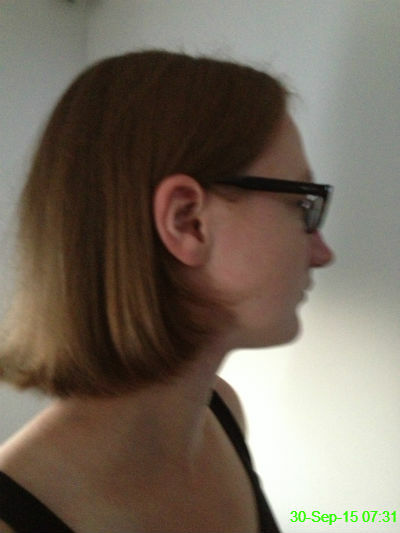 This right ear of mine was the source of much annoyance overnight as I was awake for quite a while with awful earache. 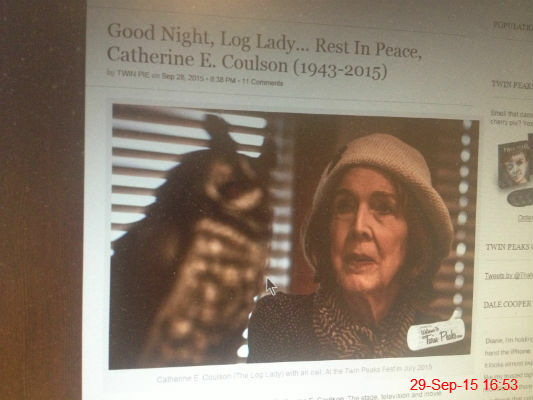 I was sad to read the news today that Catherine Coulson, who played the Log Lady on Twin Peaks, has passed away. 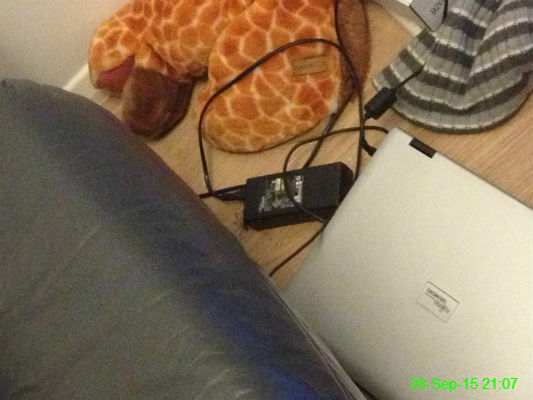 A gigantic spider decided to run across the living room floor and hide right next to my laptop (bottom left of the black box). I sent Michael in to kill it! 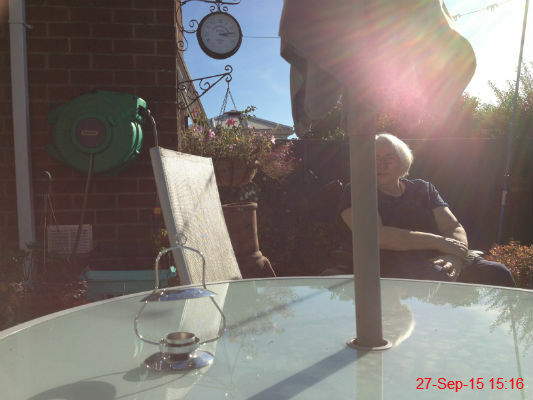 We went to join Mam and Chris for Sunday dinner and afterwards we were able to enjoy the autumn sunshine in the garden. 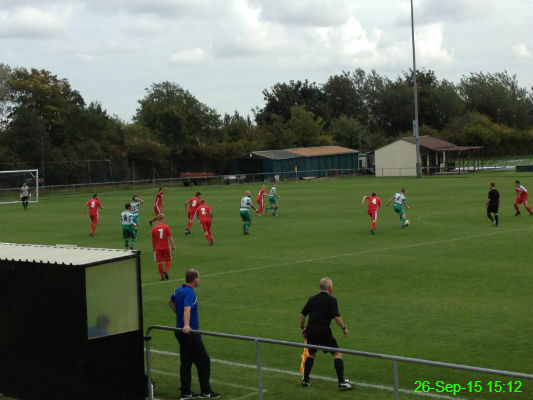 The home team fought back bravely from 2-0 down to earn a draw. 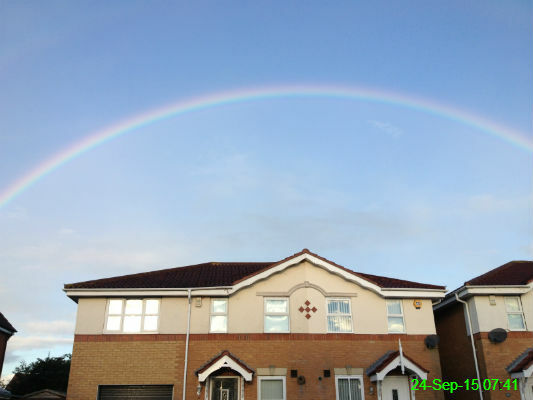 It's not often I see a full rainbow, so this was a nice way to start the day. 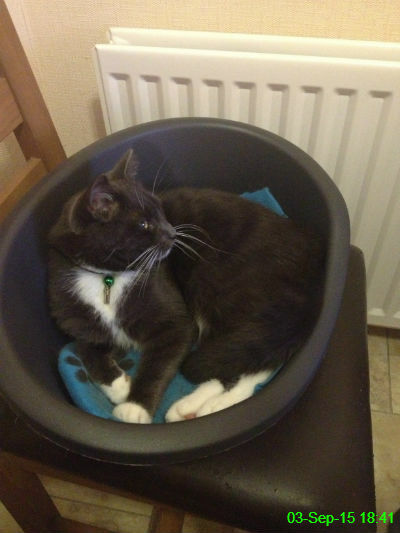 Unfortunately I couldn't fit it all into one photo without standing on someone else's doorstep! 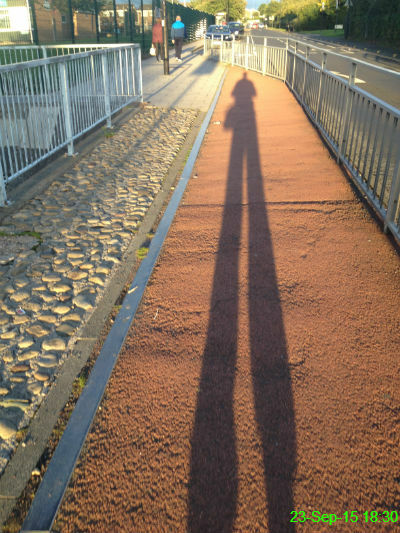 I love it when the setting sun makes my shadow look like a giant. It's just a shame we've reached that time of year where the sun is so low and it's only 6.30pm. 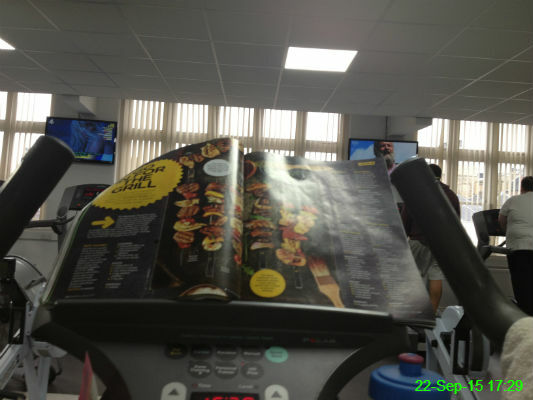 Runner's World was a particularly torturous read at the gym today as they had a feature about kebabs, which I love! Of all the things I've bought from a pub when drunk these gloves are one of the strangest. 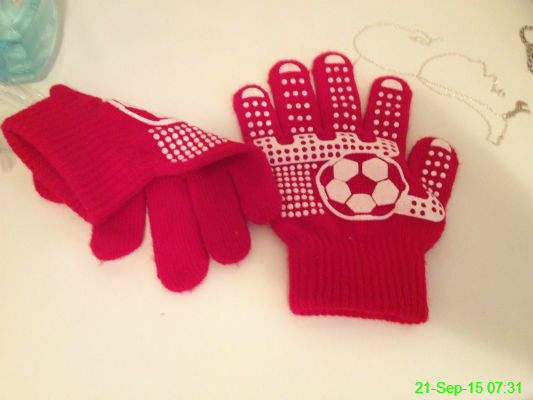 They're supposed to be for small boys but fit my hands perfectly. 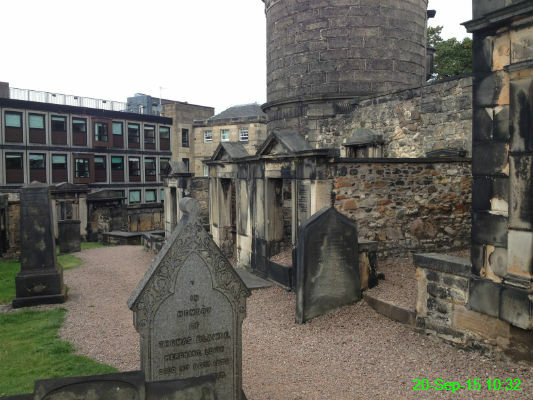 I love having a look round an old cemetery, which is perhaps a bit morbid but they're so interesting! I love it when a city centre has beautiful scenery within walking distance. 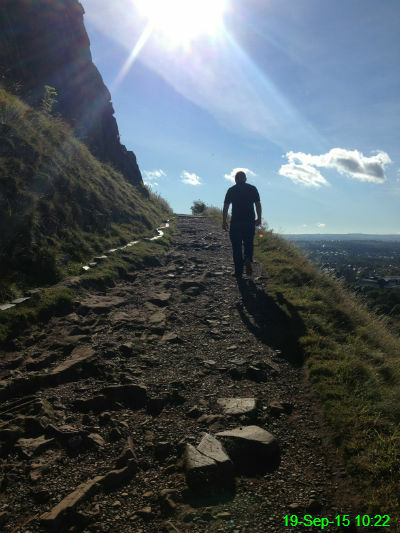 As it was a lovely morning we went for a stroll up Arthur's Seat. 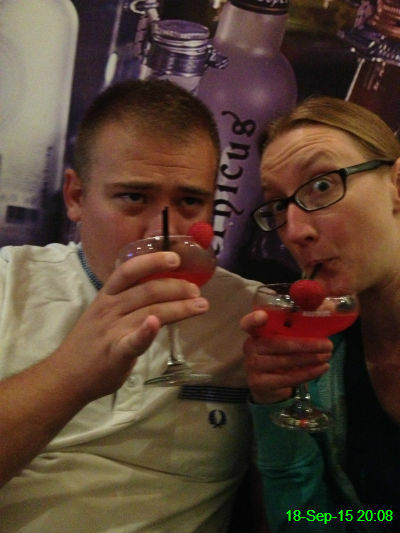 We went to Edinburgh for a few nights and started off in style with a strawberry daiquiri each. 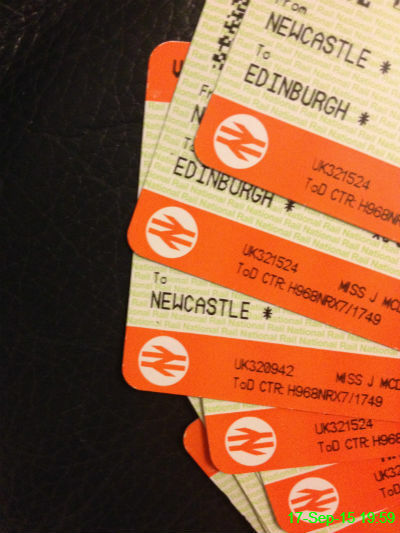 We're going to Edinburgh for a few nights tomorrow after work so of course we have about a zillion different bits of train ticket. 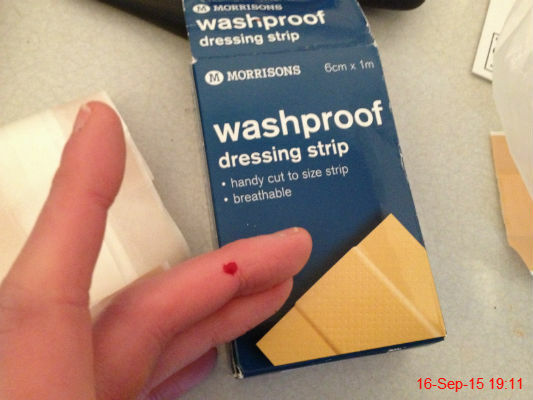 I sliced my finger while chopping carrots for tea and had to apply a plaster. It was a good excuse for getting out of washing the dishes, because every time I've used this cheap dressing it has immediately come off when wet despite allegedly being waterproof! 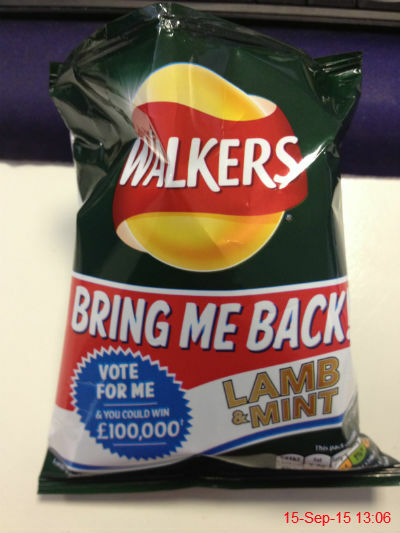 I love lamb and mint in any form so I was happy to vote to bring this flavour back. I wouldn't turn my nose up at £100,000 either. 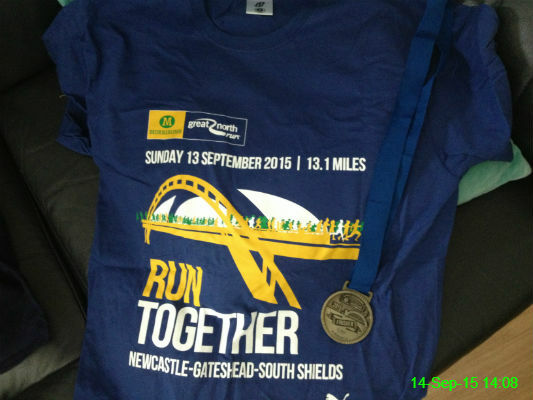 I'm building up quite a collection of Great North Run medals and t-shirts. This year's t-shirt is a nice colour but for a "small" it's absolutely gigantic on me! 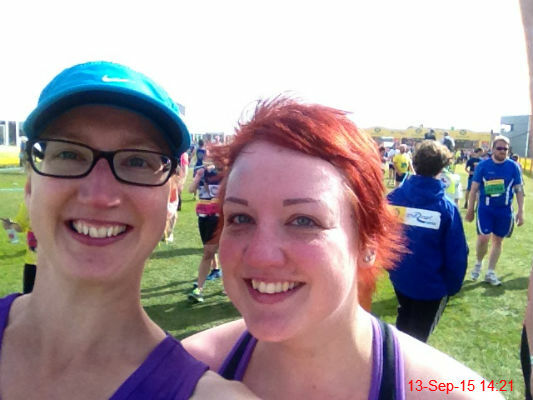 I never thought I would do a half marathon with my sister, but here we are at the finish line of the Great North Run! We managed it in just under 2 hours 56 minutes on a very hot day. I'm incredibly proud of how hard Ali has worked to achieve this! 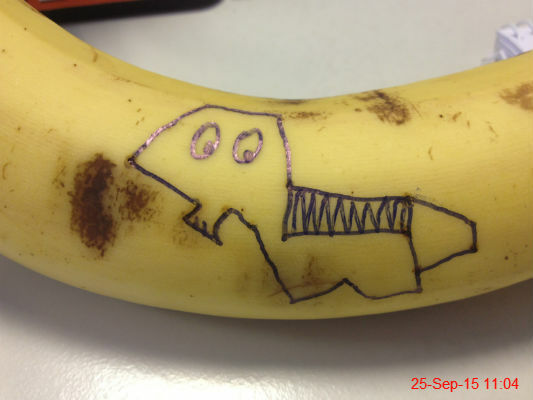 Today is all about resting, eating carbs and keeping hydrated. 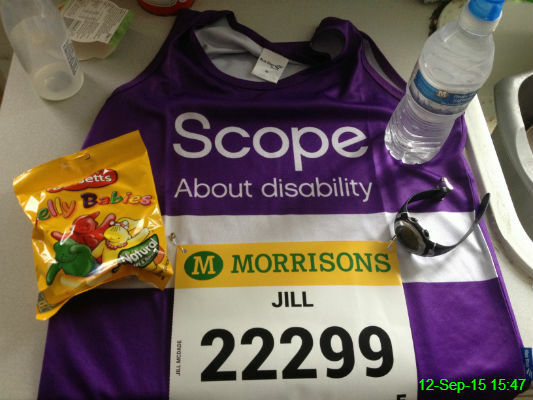 And the most important part: pinning my race number onto my vest! 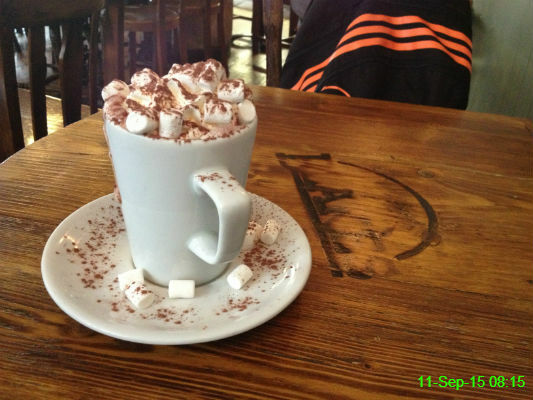 I was early for work today so I went for a deluxe hot chocolate with cream and marshmallows. I think sitting across the table from my gym bag is enough to make that a healthy choice! 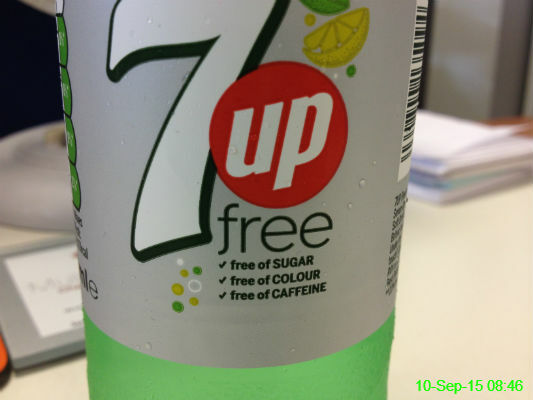 I'm cutting down on caffeine in the build up to the Great North Run and although this quenched my thirst, I didn't find the message on the packaging particularly inspiring. "Free from enjoyment" certainly sprang to mind. 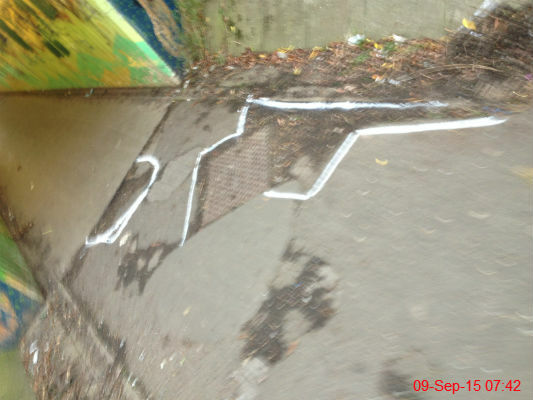 There has either been a very angular dead body here, or someone is going to do something about these potholes. 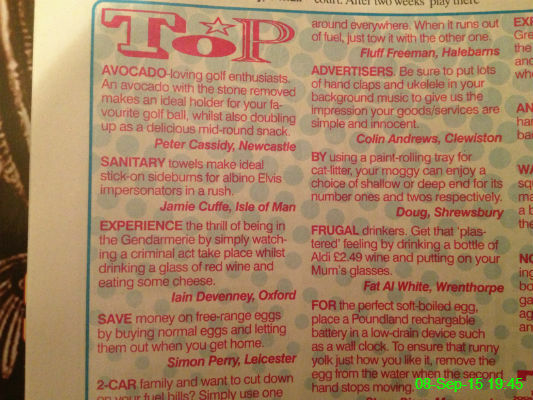 Some of the typically daft tips published in the Viz. I haven't had a TV in the bedroom since moving out of my Mam's house nearly 8 years ago, but we inherited this one that used to belong to Gran. 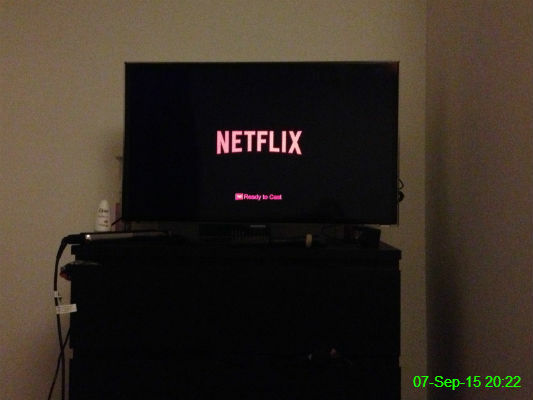 Thanks to the recently purchased Chromecast, we can now get even more use out of Netflix. 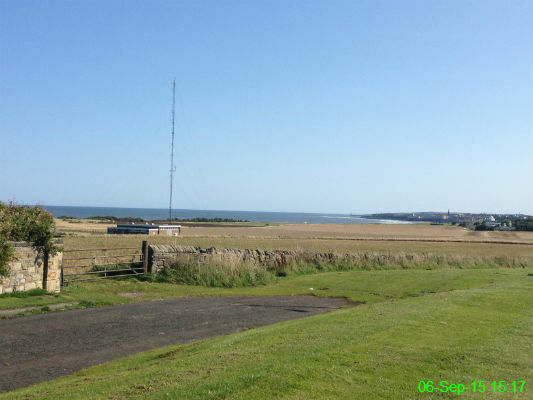 I went for an 11.25 mile walk from home to Whitley Bay via Seaton Sluice. As usual, I paused to admire the view along the coastline. 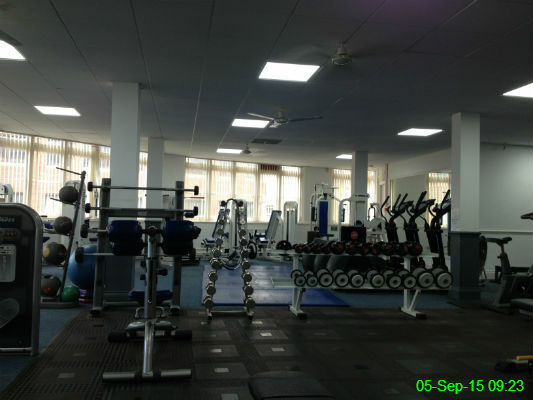 If there's one thing I love, it's an empty area of the gym on a Saturday morning. 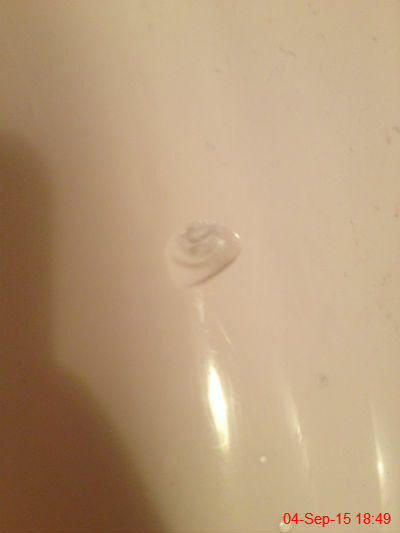 My bath has a chip in it. It's been there for as long as we've lived here, but today was the first time I'd had a good stare at it. I tried to get Carson to look at me for a photo. I was shunned. 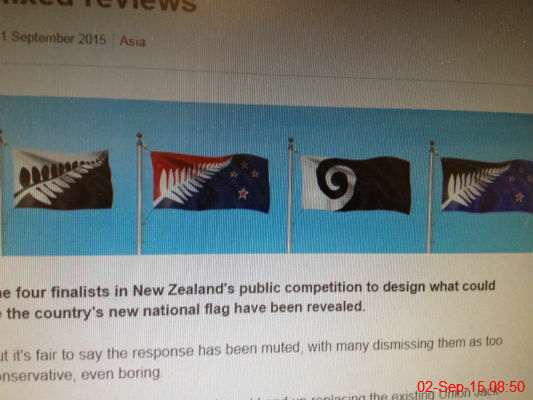 I started my day by considering a very important matter: which of the final 4 designs in the New Zealand flag competition is my favourite. I'm a simple person, so I like the black and white swirly one. 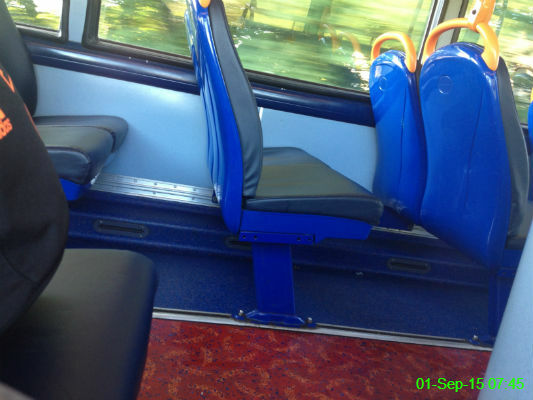 I was surprised to get on a bus that had plain seats instead of the usual bright orange and blue Stagecoach covering.